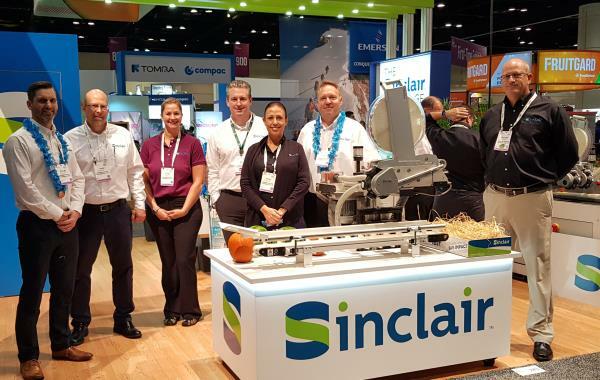 Sinclair launched its new corporate logo at the annual Produce Marketing Association Fresh Summit in Orlando, Fl, USA. Sinclair’s new logo – making it the most dramatic change in its brand since becoming the pioneer of fresh produce labeling – is emblematic of its ongoing commitment to providing customers and the industry with innovative labeling solutions and programs. Using an updated version of the iconic Sinclair “S”, a fresh blue with accents of an environmentally friendly green, the logo better reflects the corporate brand today. In addition to a new brand identity, Sinclair will also unveil a new website which prominently displays the powerful brand campaign message: “The Little Label with the Biggest Impact.” For more than 35 years, Sinclair’s dedication to providing food-safe labels for the fresh produce industry has helped marketers and grower, packer, shippers globally distinguish their produce and brand. Operating in over 50 countries worldwide, Sinclair manufactures food-safe labels and equipment systems for the global fresh produce industry that comply with all relevant legislation. The unique Sinclair Tab-Lift® feature allows fruit labels to be removed quickly and easily--- and all in one piece. To learn more about refreshed brand visit new website www.sinclair-intl.com. Or visit Sinclair at Fruit Attraction (Madrid, Spain) Hall 3, 3B 13A. More company information: Sinclair International Ltd.